Successfully Added Sports Electrocardiograph ECG Monitor - Bluetooth 4.0, iOS & Android APP, Medical Grade ECG to your Shopping Cart. This electrocardiograph (ECG) brings medical grade readings to your smartphone so you can check and monitor your health with ease. This ECG monitor can be used with a range of fitness apps including Silverunner, Running Nike+, Endomondo, Myfitnesspal, Runkeeper, and MapMyRun. It comes with an 86CM adjustable chest strap that provides a comfy fit for all body types. The ECG is a sealed unit that is both sweat proof and waterproof while the chest strap is detachable and suitable for machine washing. This ECG wil bring you a medical-grade reading in just 30 seconds. 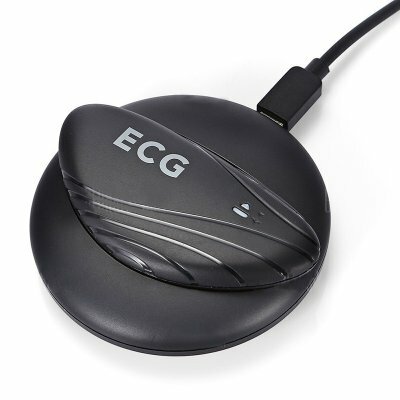 Now you can monitor your hear without patches or wires thanks to this medial grade ECG monitor that is designed to let you track your heart beat without interfering with your life. This Sports Electrocardiograph comes with 12 months warranty, brought to you by the leader in electronic devices as well as wholesale fitness gadgets..